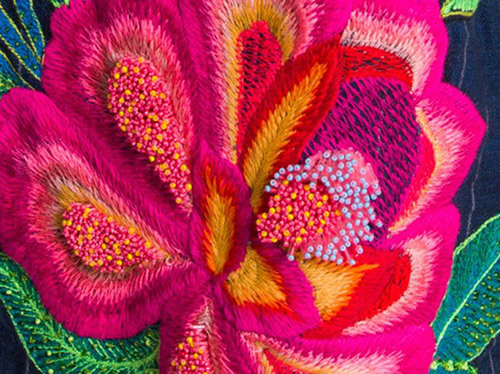 Among the cluster of museums atop Museum Hill, tucked away from the Santa Fe Plaza, an artful curation of folk and applied arts from all over the globe can be viewed at the Museum of International Folk Art. The recent Quilts of Southwest China exhibition takes an intimate look within the contemporary realm of patchwork, focusing on traditional quilting among small communities (such as the Zhuang of Guangxi) in Southwest China, and the new life that is being returned to this dwindling practice by younger generations of Chinese artists. 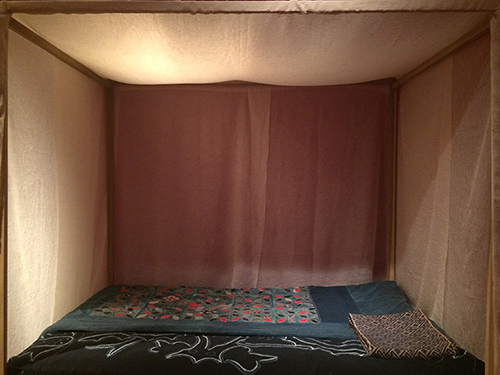 Chinese ethnic minority bed and bedding, created for Quilts of Southwest China exhibition by staff at the Mathers Museum of World Cultures, Indiana University. It is clear that the realm of patchwork is where artistic meets functional. Scraps are often repurposed, resulting in beautifully weathered mixed-prints. An inherent sense of vintage is imbued into each piece. Within the applied art of household textiles, duvets and other bed linens, tapestries and clothing for special occasions can be cut from the same cloth, mended and crafted in the same fashion. Bedcover, c.2010s. Sha Sha (Hui). Kunming, Yunnan Province, China. Collection of the Yunnan Nationalities Museum. Looking closely at this Bedcover from ca. 2010 quilted by Hui artist Sha Sha, the vivid color blocking is formed in the alternation between 52 blocks of natural-toned cotton and 52 blocks of brocaded, geometric designs. Traditional patterns and symbolism are built into each stitch. Thinking sartorial luxury, this textile brings to mind the iconic geometrics prints of Dries Van Noten, or Péro’s strong use of appliqué and embroidery techniques — in fact, Aneeth Arora discusses her travels to rural China as part of her inspiration for Péro’s FW17 Collection. Left: Bedcover, after 1970s. Miao. Gulong, Huangping County, Guizhou Province, China. Collection of the Guizhou Nationalities Museum. Right: Bedcover, 1970s-1980s. Buyi. Lipo County, Guizhou Province, China. There is often use of emblematic symbolism stitched into these quilts. The symbols reference ancestral histories or regional myths. 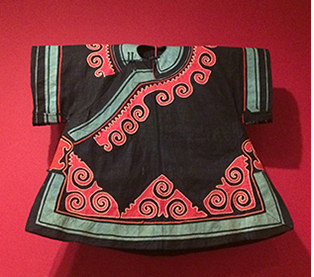 On the left, a detail of a textile dating to the 1970s-80s and originating from the Guizhou Province of Southwest China iconographically captures a dance; this dance references a legend about the birth of clouds; a tree cut down and the transformation this gives life to; the role animals play in the ancestral stories of the Miao ethnicities. An appliqué technique was used here that involves mounting a paper drawing onto a piece of fabric, where the shapes of the drawing are then cut from the cloth and intricately placed onto a fabric substrate. On the right, the ancient sartorial technique of embroidery using fine threads is featured in this Buyi quilt, which also dates to a similar time as the quilt featured on the left. Top Left: Prada SS17 Mandarin Collar Suit | Photograph by Gio Staiano | Courtesy of NowFashion. Top Right: Woman’s Jacket, 1900-1950. Yi. Malipo County, Yunnan Province, China. 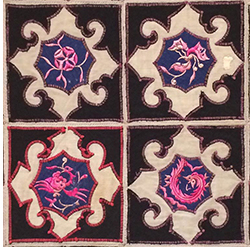 Quilts of Southwest China | Museum of International Folk Art, IFAF Collection, FA.2006.59.5. Bottom Left: Etro SS13 Silk Dress | Courtesy of Fashion Magazine. Bottom Right: Woman’s Woman’s Jacket, 1900-1950. Yi. Northern Yunnan or Southern Sichuan Province, China. | Quilts of Southwest China | Museum of International Folk Art, IFAF Collection, FA.2006.59.2. 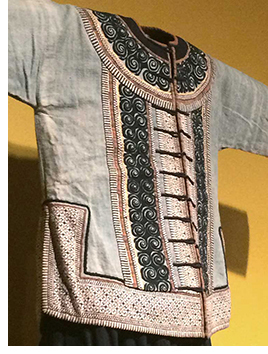 Top right is a Yi women’s jacket; this article of women’s clothing dates back to the first half of the 20th century and is from the Yi of the Malipo County. It features the same patchwork piecing and embroidery techniques used in the quilts that surround it. 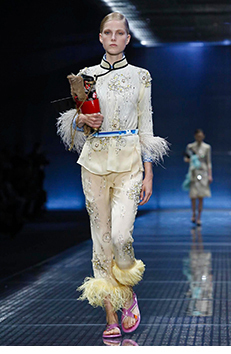 The high Mandarin collar and the use of silk material is parallel to the styles we see in the current fashion industry. 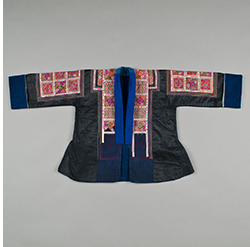 On the bottom left, The Miao women’s festival garment features an asymmetrical neckline and a robe / silk wrap dress quality that are also being used in modern cuts. 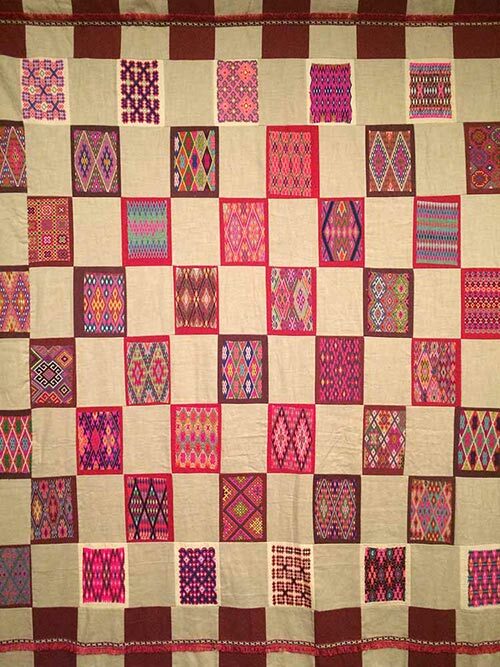 The Quilts of Southwest China exhibition in particular sheds light on the history of patchwork, as well as its current use among artists living in rural communities of Southwest China. It illuminates the history of how quilting techniques used in the realm of home textiles crosses over into textiles worn for dress, and how traditional motifs find a place in contemporary fashion. Top: Mieko Mintz | Bottom Left: Greg Lauren | Bottom Right: Woman’s Jacket, c. 1984. Small Flower Miao. Near Guiding, Guizhou Province, China. 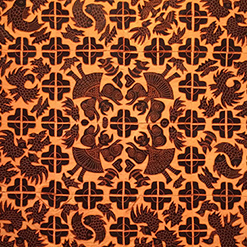 Quilts of Southwest China | Museum of International Folk Art, gift of Phila L. McDaniel, A.2004.5.1. Photo by Carrie Haley. 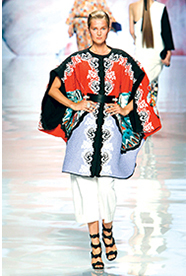 The role of quilting techniques in our contemporary fashion industry is ongoing; these techniques took explicit form in patchwork styles, popular in the sixties and seventies. 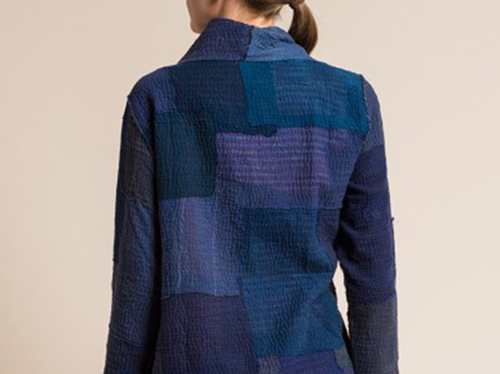 Patchwork, among other motifs drawn from traditional quilting practices have surfaced recently in the more subtle iterations such as altered denim, Japanese boro, mixed prints and recycled fashion. 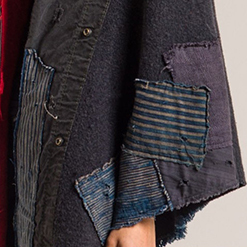 We see this in pieces from Greg Lauren and Mieko Mintz. The relationship between these current trends and the traditional quilting practice in the arena of the handmade is fascinating.